384 pages | 111 B/W Illus. Processes for clearing gases from dust in wet-type dust separators are widely applied in many industries for technological purposes and environmental control. Among goals of these processes is to ensure high efficiency of dust removal with minimum energy costs. 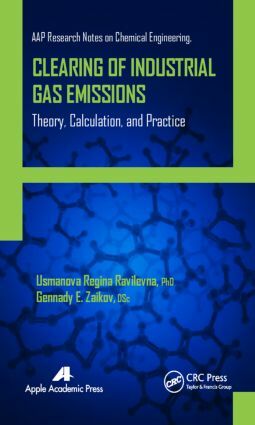 This book presents the newest scientific research data under the theory and practice of wet clearing of industrial gases from dispersion particles. The authors consider the modern aspects of the separation process and gas-dispersed impurities. In the literature there are no reliable methods of efficient clearing of gas emissions in scrubbers. This creates complexities at calculation and designing of these apparatuses and also complicates process intensification. The authors develop methods of calculation of process of gas cleaning on the basis of studying of hydrodynamic characteristics of apparatuses. Usmanova Regina Ravilevna, PhD, is a professional mechanical engineer with over 15 years of experience in practicing mechanical engineering design and teaching. He is the author of over 200 articles and reports in the fields of fluid mechanics, fluid dynamics, separation, and working out of apparatuses for gas clearing. He is currently associate professor of the chair of strength of materials at the Ufa State Technical University of Aviation in Ufa, Bashkortostan, Russia. Gennady E. Zaikov, DSc, is head of the Polymer Division at the N. M. Emanuel Institute of Biochemical Physics, Russian Academy of Sciences, Moscow, Russia, and professor at Moscow State Academy of Fine Chemical Technology, Russia, as well as professor at Kazan National Research Technological University, Kazan, Russia. He is also a prolific author, researcher, and lecturer. He has received several awards for his work, including the Russian Federation Scholarship for Outstanding Scientists. He has been a member of many professional organizations and on the editorial boards of many international science journals. He is the author of over 3000 articles and reports in the fields of theory and practice of polymers, including aging and the development of new stabilizers for polymers, organization of their industrial production, life-time predictions for use and storage, and the mechanisms of oxidation, hydrolysis, biodegradation, and decreasing of polymer flammability.